Late on a stormy Friday afternoon in January, a blessing was held for the annual Tiger Longboard Classic and the newly-created Pua Ka’ilima Cultural Surf Park. Pua Case’s Halau Kealaonamaupua graced the gathering with dance and chants. Billy Mitchell led us in blessing the land and the people _ reminding us of our special relationship with the ocean. 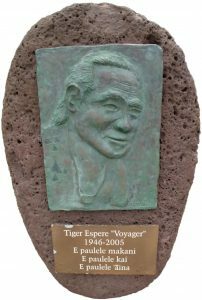 Nearly two years ago, an article appeared in the Waimea Gazette introducing the park and its “vision for the future with an eye on the past.” During that period, the newly formed board of directors and park supporters had come together to plan and build a surf park at Kawaihae Harbor. At that time, the park’s future was uncertain. Negotiations for a lease were still in progress with the State Department of Transportation and a source for irrigation water was still unknown. Happily, the lease was signed in early 1998 and a more adequate water source has been secured for now and into the future. Pua Ka’ilima Surf Park, Inc. is a non-profit corporation created to develop a world class surf/life saving park for the community of West Hawai’i on 1.4 acres at the Kawaihae breakwater. The board of directors include Tiger Espere, Bob Simms, Roger Harris and Dave Barclay. During the winter months, the park is ideal for surfing at all levels, from beginner to expert, and provides a perfect location for other ocean activities including kayaking, fishing, swimming and diving during the calm months of the year. As the population continues to grow, Pua Ka’ilima _ the first facility of its kind on the Big Island _ will afford unrestricted ocean access for our people and visitors. kayaks and other equipment for convenient use by members. There also exists a resource of highly qualified ocean safety experts and native Hawaiians with cultural knowledge who would be willing to teach and share their experience with others. The life saving facility, combined with the park, will be an appropriate and exciting venue for these programs. As a community-based park, Pua Ka’ilima receives its support from many sources. Large and small businesses and individuals have all contributed time, materials and money towards the park’s success. Moving formidable rocks and boulders was a job that Hawaii Stevedores and Rex Thompson with the Young Bros., Ltd. forklift undertook with great capability. Matson Navigation deposited a forty foot steel container at the park’s perimeter for clubhouse storage. A substantial load of topsoil from Robby Hind and Parker Ranch was delivered, making way for the next phase. Mike Luce Construction spent hours grading the surf/life saving club area and the Mauna Lani Bay Hotel and Bungalows brightened the appearance of the park’s midsection with kamani and monkeypod trees. Monetary donations from local businessmen made it possible to survey for the delineation of boundaries, and helped buy a water line, an automatic drip irrigation system and wood for the ocean access steps. Volunteers, too numerous to mention individually here, showed up with sleeves rolled for the installation of the steps, digging of the water line and planting an aesthetic windbreak of over two hundred trees and shrubs from Mark Burgess of Kohala. The hard work, sweat and generosity of this community has surely been, and will continue to be, a major dynamic force in the future of this people’s park.